A powerless Freddy Krueger manipulates behemoth Jason Voorhees (from the Friday the 13th series) to carry on gruesome killings in Freddy’s hometown of Springwood. 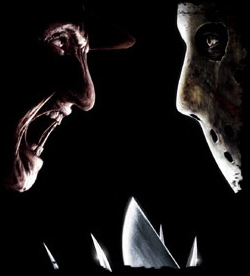 However, Freddy quickly loses control of the unstoppable Jason, which results in the two horror icons battling to the death in Freddy vs. Jason. Several scripts are available here: the final draft by Damian Shannon and Mark Swift, and rejected drafts submitted by various screenwriters. All of these scripts are available in PDF format. Freddy vs. Jason languished in development for almost ten years. New Line Cinema tried on multiple occasions to develop the film but could not find a concept that worked. Many of Hollywood’s elite screenwriters took a stab at writing a script, but none of them were able to capture what New Line was looking for. Courtesy of Shivers of Horror. The headline reads: “Child Killer Set Free.” There is a PICTURE of Fred Krueger walking down the court steps, smiling. We HEAR: the screams of a mother, the outrage of a father. And then, the familiar laugh of Fred Krueger. But then, the edges of the newspaper start to cinder… and burn. Flames crawl up the side of an old Industrial building. A window explodes. We hear Fred Krueger SHRIEKING inside. He can’t get you now. He’s dead, honey… because Mommy killed him. But then, the tide turns. Freddy getting beaten. He’s put down with a flash of light. Sent back to where he came from. They tried to forget their fear. Lock Me away like a dirty secret. CLOSE ON — Freddy’s Krueger’s eye. Fire is reflected in it. We don’t know where he is, but we can feel his anger. But I found someone. Someone that’ll make ’em remember. Next to the mask, Freddy’s claw breaks through the earth, grabs the hockey mask and yanks it down.